Ron Horton contacted us a few weeks ago regarding the creation of a low-cost website. Ron has over 30 years of experience as a hair stylist and used to own his own business. He then sold out to a family member and started teaching for a few years before deciding that wasn’t for him. He then went back to work as a hair stylist at a local salon in Bossier City, LA where he rents a booth. Ron is hoping to reach out to some of his previous customers to drum up business and he wanted to market himself by getting a website online. Originally, Ron attempted to make a website himself but didn’t have much luck. He then had us set everything up for him. He sent us the specifications, content, and information that he wanted on the website in addition to how he wanted the site designed and colored. We put all of his information together and had his site done in just a few short days after receiving everything! Thank you for your business, Ron, and we look forward to helping you with search optimization needs! 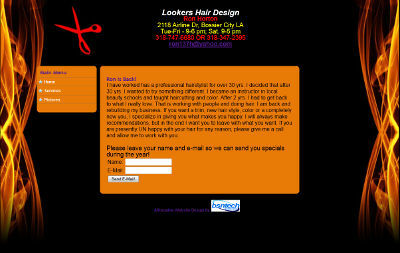 Ron’s website is at haircutsbossier.com.